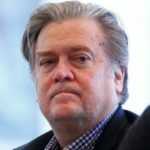 Donald Trump has removed his close confidant Steve Bannon from the White House National Security Council, and Bannon is far from happy about it. The New York Times reported that Bannon had threatened to resign over the move. And now Politico is reporting that Bannon only remained in his White House Chief Strategist role because Rebekah Mercer – his business partner at the mysterious firm Cambridge Analytica – talked him into staying. In the days after Donald Trump was named the winner of the 2016 presidential election, article after article credited the victory to the voter data work conducted by Cambridge Analytica. It’s since come to light that Steve Bannon was the Executive Chairman of the company at the time he took over the Trump campaign, and that billionaire Rebekah Mercer and her family largely fund the company. It’s been widely theorized (though not in any way substantiated) that Cambridge Analytica was using the data that Russian hackers stole from voter registration databases and allegedly fed to the Donald Trump campaign through the now-infamous Trump Tower email server. But whether this theory is true or not, what does seem more clear is that Bannon and Mercer had been putting their efforts into Cambridge Analytica prior to the 2016 election because they wanted to help someone of their liking get elected.